I just thought that this was a cute picture. She rarely smiles for pictures, so I was happy. I bought this little blow up car for $2 at our grocery store and she loves it, I was so sick of blowing it up that I finally hid it....does that make me a bad mom? As most of you know Jeff is a BYU football fanatic. So we had to have a family picture in our BYU attire. I came in the room to check on Morgan during a nap and this is what I found. So cute! But who couldn't love this face? Honestly look at this. Jeff has SOOOOO many hats. After I saw this I told him no more. I jumped in the shower one day and wrapped Morgan up in a blanket and when I was done this is what I found. She must have been awfully tired because she RARELY and I mean rarely falls asleep unless I put her down in her bed. Does anyone else hate meal time? She gets SOOO messy that finally I just started taking her shirt off because it wasn't worth the hassle. She is doing a little better now, but my goodness. Jeff decided to buzz his head. The sad thing is that when he was done he came out and said, "Well?" and I didn't even notice! haha He has now grown it back out again. I keep meaning to post but somehow life gets away from me. Does that happen to anyone else? Here are pictures from Morgans birthday. We just had my brother and his family over for cake and presents. I think she was just more excited to see them than the cake OR the presents. I think she was a little confused why everyone was singing to her even though we have been to a lot of birthdays lately. Enjoying the singing a little more. Enjoying her tea set. She LOVES it. My little niece Kennadi was enjoying the tea set as well. So fun, thanks guys for coming over! When I was pregnant with Morgan I went to the Dr. three weeks before I was due and I was dilated to a three and 80% effaced. The Dr. told me there is no way I would make it to my due date. I was so excited! I went to back to work and told some of my students who worked next to me that they may have to take me to the hospital so be ready. Yeah right. Three weeks later ON my due date I was back at the Drs. office and they had to strip my membranes....OUCH and we scheduled an inducement date. I wasn't too excited about this because I was worried that #1 I knew exactly the day I would have the baby...that is nerve wracking...I think I would rather have a surprise. #2 What if she was supposed to come on a different day. Oh well. I went on a walk every day that week trying to get her out...no luck. So the night before we were supposed to go in I was a mess. I was SO nervous!!! So Jeff being the good husband he is saw the need for me to get some ICE CREAM! mmm We went to Cold Stone, I just remember people asking me when I was due and just freaking out in my head as I said I am going in tomorrow!!! Well, that night I couldn't sleep very well and not just because I was pregnant! I don't know how you ladies do it who have these things planned!!! I was supposed to call the hospital at 6 to let them know we were coming in and to see if there was enough room. I woke up at 4 with an awful cramp. I hadn't had any the whole time I was pregnant so I was a little nervous, but I tried going back to bed. Three minutes later another.....and so it went for about an hour. I woke Jeff up and told him that I thought I was in labor, he just said no your not we don't go in until 6. Silly boy. So I tried walking around the house...yeah, that didn't help, so I tried taking a hot bath..it helped a little but finally I got Jeff up and said we had to go. I think at this point he was in a little more shock than I was. We got loaded in the car and were on our way! I just kept saying, "what are we doing? What are we doing? We can't do this!!!" haha I was FREAKING out in between contractions that were still coming every three minutes. It was a constant thing from that first contraction and they were painful RIGHT from the beginning. We finally get to the hospital and into our room and sweet Jeff called his brother at 6 in the morning to come give me a blessing and the good brother in law that he is he showed up as fast as he could. At this point I was in my bed, a little more calm and I just looked at Jeff and asked if it was to early for an epidural. I was sure I was going to last much longer than that! (It was 8 so I did last for four hours) I thought I had a higher pain tolerance, oh well, such is life. The epidural was heaven. After that I was just anxious. My goal was to have her by the time Price is Right was on. (We love that show and were planning on going one day but that is a WHOLE other post) At this point my Mom was there and we were all just sitting in my room waiting. My mom was a little annoyed she just kept saying it wasn't fair, she was supposed to be helping me, but all she was doing was reading a book! That is the beauty of epidurals!!! Anyway, she wasn't out by the time the Price is Right was on, but by 12:32 p.m. Morgan Annine Sucher was here! She was 7 Ilbs 14 oz and 20 inches long. I only pushed for about 20 minutes. She had gunk in her lungs so they had to suction her out and we were only able to hold her for a few minutes, then they whisked her away and Jeff went too. I didn't know where they were going at this point I think maybe I was a little too drugged. Overall it was a great pregnancy and good delivery, only eight hours from start to finish. 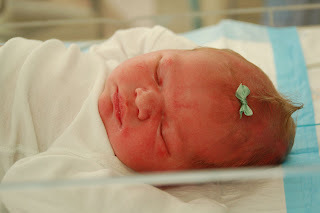 Morgan was very jaundiced so we were able to take her home but the next day she had to go back to the hospital and stay another night under the lights. This is not very fun for a new emotional mother...not my favorite day but we are just glad she is healthy now. After she was born the Dr. said she was one of the most feisty babies he had delivered. She is still a feisty one! *She can sing her ABC's and a few other songs. She likes to play her piano and sing twinkle twinkle little star. *She can count to 15 then after that she makes it to 20 with a few mistakes. *She can tell me most of the letters of her alphabet. *She tries to do handstands with her Daddy which end up turning into a somersault. *She loves Mickey Mouse Clubhouse. *She is very good about saying please and thank you. She even says bless you and excuse me after sneezing. She is such a blessing in our family and we are so grateful for her. Happy birthday Morgan, we love you! Well, this is just going to be a random post of things that have happened lately. I was just going to put Morgan in a princess outfit for Halloween but then my Sister-in-law said I should have her be Minnie Mouse since Mickey Mouse Clubhouse is currently her favorite thing. I thought that it would be fun but I could find a costume I loved....well, there were some but they were like $30, I just think that is crazy to spend on a Halloween costume. SO I got a brilliant idea I would make one. haha, it has been quite the adventure but here is how it has turned out so far, I am pretty darn proud of myself, seeings how I have only made one pattern before...just don't look to close. My friend Meggin and I went to get ice cream at Dairy Queen this last week...mmm....I got a pumpkin pie blizzard which was SOOO yummy...anyway, I got Morgan a star kiss thinking it is a kids ice cream and it would be ok....no, not so much. She was a mess, I got her home and cleaned her up and she still looked like this. Ok, not a great shot but can you see the red and blue on her face and fingers? Look at those fingers!!! Look at her arm! I had to hold her arm down to get a picture but look at that! Do not get the star kisses from Dairy Queen....not a good idea. This is not a very good picture either...our batteries are dead to our good camera, but you get the idea. Gala apples were on sale this week for $.59 a pound and they are my favorite! So I thought I would buy a whole bunch and dry some! So I looked up how to dry them in the oven and they turned out so good! I was excited. I thought Morgan would like them more but I don't think she is to impressed. But it was fun and I felt so domestic, and my house smelled so good. p.s. We are still looking for baby girl names keep the ideas coming.